Nottingham City Transport’s epic time lapse video! Time lapse video may be “Bang on Trend”, but to really shine it needs a great subject. 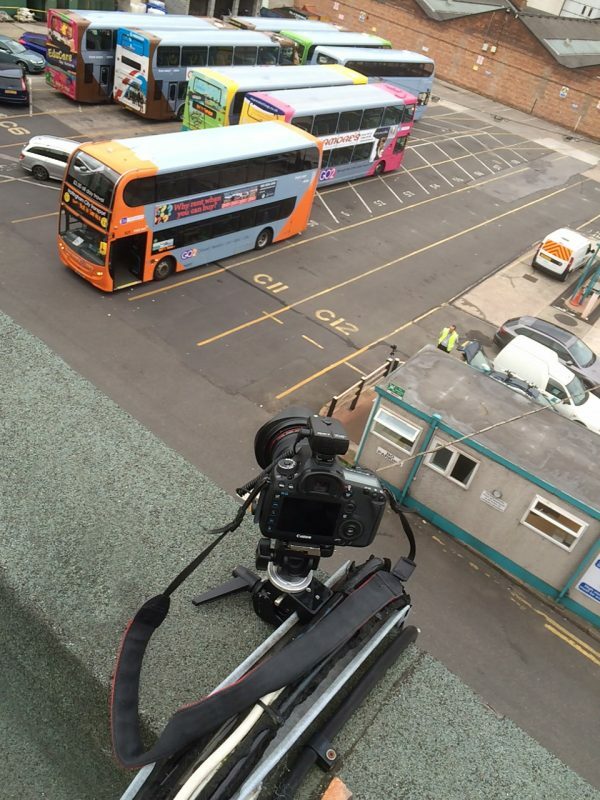 When we first started working with Nottingham City Transport to produce videos we realised that the overnight turnaround of their fleet would make a great time lapse video, and last June NCT pulled the trigger on the production. But this wasn’t going to be any simple time lapse video, it was going to have to be shot live and in one take, using multiple cameras to capture multiple scenes all at the same time. Plus there were substantial health and safety issues, in particular working at height at night in several locations, as well as working amongst a large number of moving vehicles in a complex environment, again, in the dark, and also after a long overnight stint with no sleep. We solved some of the height issues by mounting remote cameras, but the main A-roll shot was going to involve two cameras which would require attention continuously, on a roof accessed via ladders in the dark. This site required harness restraints and the creation of roped safe zones, and using rope access to bring equipment on to the roof. In total six cameras were employed, mainly the redoubtable Canon 5dmk3, and a four person crew. We also captured location audio separately. One of our Canon 5d mk3’s on location during the NCT time lapse video shoot. June had been chosen as the best time for the job, as close to the Solstice as possible, with the advantage of as much light as possible late and early. Our plan had been to go in the week prior to the Solstice, but the weather was not cooperating with a never ending procession of low pressure systems marching across the country. Finally a widow opened with only a 50% chance of showers on the night of the 22nd/23rd, so we went for it! There is nothing quite like a McDonalds on a roof in the city centre, with the stars overhead and the nightlife on the streets below, and despite rain earlier in the day it turned into a glorious evening. With no weather issues the shoot went smoothly until the last bus was put to bed, a quick two hour kip for the crew in the boardroom, and then up for the first bus out. The end video was released by NCT in early September, and had 32,000 views in the first 18 hours on Facebook, (with 90% per cent of views watching the video in full… which is a very very very low bounce rate) as well as critical acclaim. “We love a good time lapse. Right now, time-lapses and 360-degree video are incredibly shareable. Bang on trend. It’s mesmerising. It keeps you watching. There’s something oh so very satisfying about watching all those little double deckers filing through the bus wash and into their neat little lines, all cleaned and ready for bedtime. Time lapse is an excellent tool if used appropriately and we regularly employ it where there is a good opportunity. If you think you’ve got a good time lapse video opportunity, contact us to see how we could help turn it into a marketing asset! There seems to be three ok ways, time-lapse, timelapse, or as we have done here, time lapse. Our spell check brings back time-lapse video, my instinct is timelapse video, but a lot of places spell it time lapse video. time-lapse, timelapse, or time lapse, it’s all the same I suppose, compressing a long period of time into a short period thus speeding stuff up… Not to be confused of course with hyperlapse (or hyper-lapse or hyper lapse) which we have also used in this video!